Coll. No. 140, 22 Sep 1997, characters observed: Annual, tap-rooted, to 18 cm. ; Leaves, basal only, petiole 7 mm., blade 13 mm. × 11 mm. wide, round-ovate; Involucre, sessile in axils, 2.5 mm., angled, margins hairy; Flowers, 2 mm., pink, glabrous, outer perianth lobes neither fan-shaped nor hastate. Field Notes: Coll. No. 140, 22 Sep 1997. U. S. Highway 395: at Rush Creek. 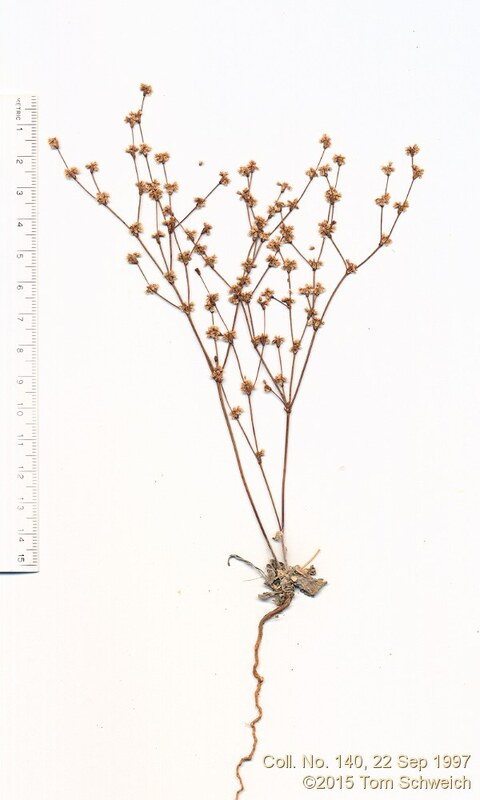 Other photos about Species - Polygonaceae or Eriogonum davidsonii.